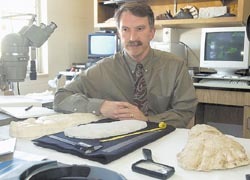 "ISU professor seeks to uncover truth about Sasquatch"
Jeff Meldrum, an associate professor of biology at Idaho State, looks over some Sasquatch foot casts. Pocatello, Idaho -- It's not every town that boasts a bona fide Sasquatch expert, but Pocatello has one in Idaho State University anatomy professor Jeffrey Meldrum. Meldrum, who specializes in the anatomy of the locomotor system in primates, became interested in doing serious research on the legendary North American ape after seeing some 35 to 45 clear prints in the ground in 1996. Those who are intrigued by the stories of Sasquatch can attend a free public seminar, "Sasquatch, North America's Great Ape," at 7 p.m. Friday Sept. 27th. The seminar, hosted by Meldrum, will feature Canadian wildlife biologist Dr. John Bindernagel, who will also be signing his book by the same title. We digress - back to Meldrum. By reading the answers to the questions posed below, you might not learn that Meldrum is hot on the trail of Bigfoot. Instead, you'll learn that the man who has devoted years of research to discovering the truth about the secretive hominid is the father of six sons, a loving husband and chivalrous, too. Meldrum: My first inclination was to say my wife's sour cream enchiladas, but if I had a menu in front of me I would gravitate toward seafood, especially fresh grilled salmon with capers (sorry, Honey). ISJ: If you could return to any age, what age would you be and why? Meldrum: If I could return knowing what I know now, I'd have to say my newlywed days so I could take another shot at being a better husband. ISJ: When (and if) you arrive at the gates of Heaven, what would you like to hear God say to you? Meldrum: "Not bad. Not bad at all." (like the final scene in Independence Day). Meldrum: The computer, because it has provided such amazing opportunities for creativity and information sharing. ISJ: What's the heaviest piece of furniture in your house? Meldrum: The 2 by 6 frame bunkbeds I built for my boys, twice. ISJ: Who are your top three dream dinner partners? Meldrum: This is tough - me take a different tack on it. If aiming for stimulating conversation, then a historian, a philosopher, and a cosmologist. For entertainment: an impressionist, a channeler, and a magician. ISJ: If you won the lottery, how would you spend the money? Meldrum: First, reasonable financial security, then freedom to do some travel and exploration with my family, and to spend some time in humanitarian service at home and abroad. Meldrum: The novel my 18-year-old son wrote and published, The Dreamer. Meldrum: It would have to be the day our first son, Colin was born, followed by the birthdays of the next five sons. ISJ: What's in your refrigerator? Meldrum: It's the end of the week, so not much at the moment (I have six growing boys). ISJ: What's your favorite movie? Meldrum: This is transitory - "A Knight's Tale." I get a kick out of seeing my 2-year-old pounding his fist along with Queen singing "We will, we will rock you!" I have always been intrigued by the notions of medieval chivalry. Meldrum: I am the master breakfast chef. This has become a tradition in our home. From western omelettes to thick-sliced French toast, my boys rarely start the day hungry. Organizing the garage and maintaining the vehicles. Painting the house interior - a bit of a challenge coordinating six pairs of helping hands. Meldrum: This is a stretch but I would have to guess it was a Jim Croce, "Time in a Bottle." We don't even have a turntable anymore. Meldrum: Exploring new places, camping, sharing experiences with my family without any worries or distractions about the future. ISJ: What's your greatest fear? Meldrum: Not fear but concern: the well-being of my family. ISJ: What can't you do that you wish you could? Meldrum: Remember people's names on the first introduction. Spend more time pursuing field research. ISJ: Where would you most like to live? Meldrum: Nothing compares to the West, but as long as I am close to family, I have found that every place we have lived offers interesting history, experiences and opportunities. ISJ: How would you like to die? Meldrum: With my wife, knowing that I had lived a full productive life with the assurance that my boys' lives were off to a great start. ISJ: What would you like to be reincarnated as? Meldrum: Hmmmm. A dolphin. What an opportunity to explore a different world! of International Copyright Law as educational material without benefit of financial gain.